Christian Pearson, from Misheye, has been a client of ours for many years now – 6 years and counting! 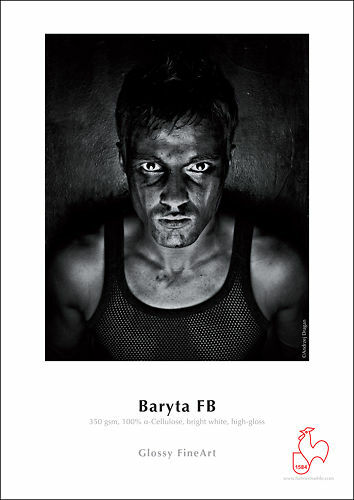 He works as a commerical photographer within the diverse range of Architecture, Industrial and Landscape photography. Christian has a love for exhibiting and in the past has drawn upon the ordinary found in his commercial work to create a differing perspective for his own visual art. Hahnemühle and their quirky Rooster have been making art papers for over 400 years. 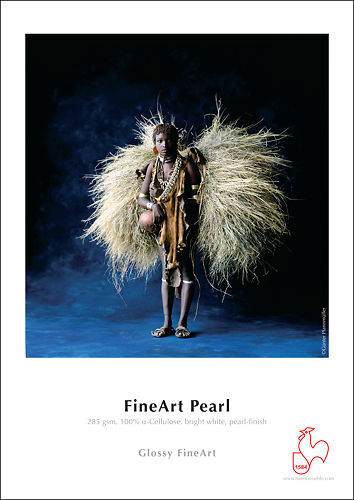 In the modern era, they have successfully transitioned into the digital domain more successfully than any other brand and they are the market leaders in digital fine art all over the world. 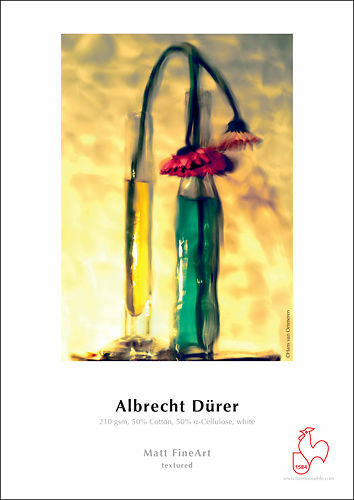 Our own introduction to digital fine art began with a Hahnemühle sample pack way back around 2000, and we've never looked back. Opening that first pack of paper was a revelation - at last photography could be achieved on the sorts of gorgeous papers all other visual artists had been enjoying for centuries. 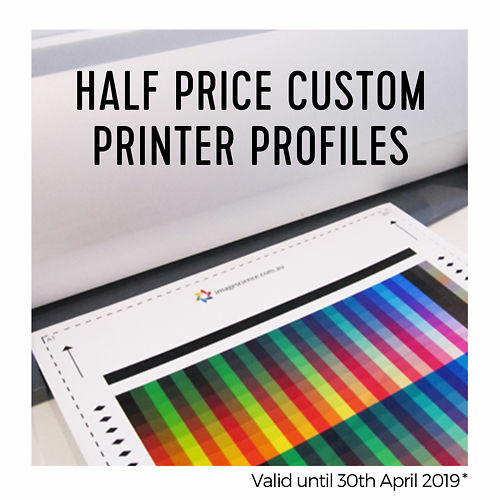 The Hahnemühle range is both broad and superb in quality. 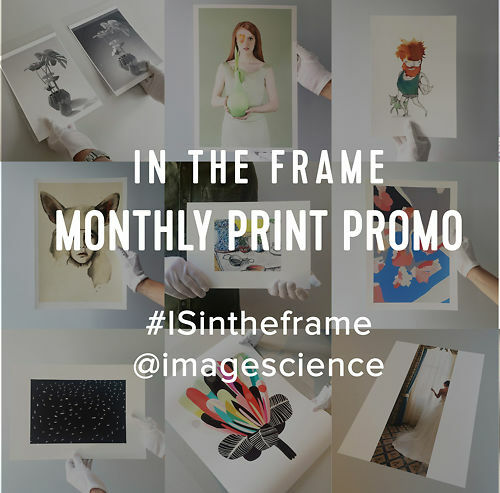 Availability and pricing in Australia is legendary and for the last 15 years Image Science has been an integral part of that. We have been proud to sell and support Hahnemühle for almost 15 years, and as a Hahnemühle certified printer we can safely say their materials have been a key component of our success across the board. Our unique structure of offering both Hahnemühle products and fine art services based on those products gives us absolutely unmatched practical experience to draw on - and we're very happy to offer guidance in paper choice and tips on how to get the best from your Hahnemühle paper. There are quite a few favourites in the Hahnemühle range - all of them papers that we use for our own in-house fine art printing services. We have tested them extensively and use them daily! 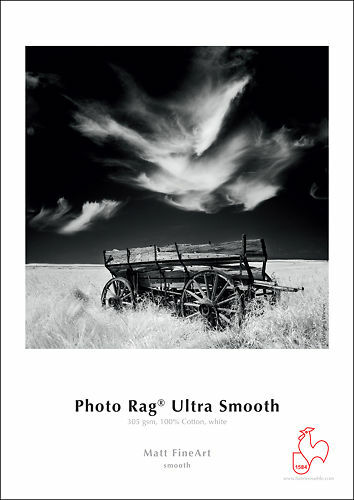 The Hahnemühle digital fine art materials include the world's legendary Hahnemühle Photo Rag - easily the most popular fine art digital paper in the world and we print literally kilometres of this paper every year ourselves. Capable of both delicate expression and punchy results, this is a classic everyone should try. 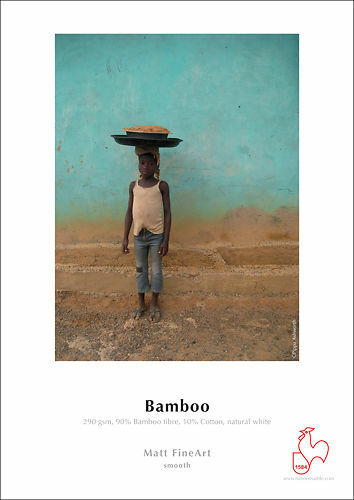 Hahnemühle Bamboo is a similar modern alternative - with a luscious warm tone, it is made from 90% bamboo, a highly renewable resource - this is our most ecologically friendly paper option and is just beautiful! 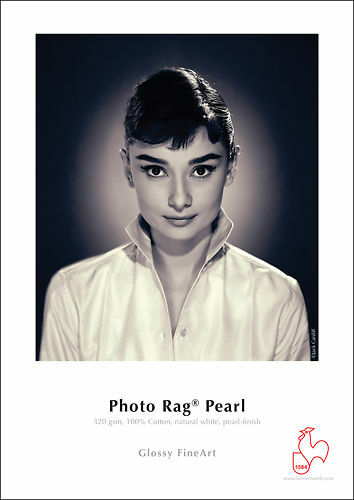 A real favourite for black and white portraits and art reproductions needing a warmer base tone. 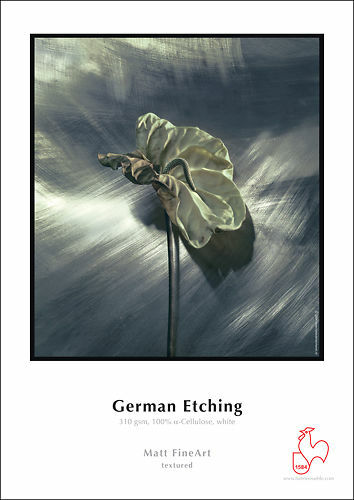 Hahnemühle German Etching - with a delicate, regular, classic etching texture, this one is very popular with both our photographic and art reproduction clients. 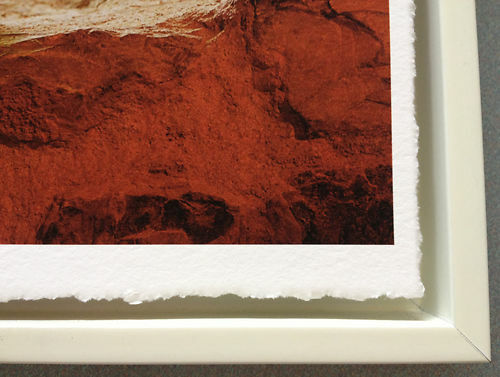 Hahnemühle Torchon is more textured paper with an organic, watery like texture and a bright white colour. 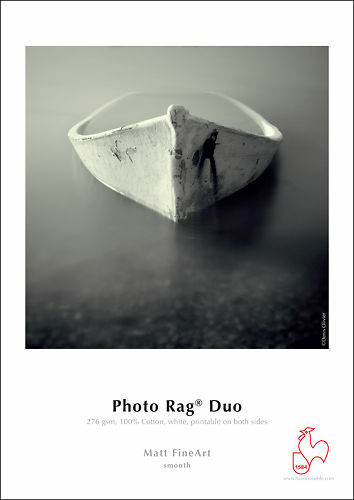 Particularly popular with larger art reproduction prints. 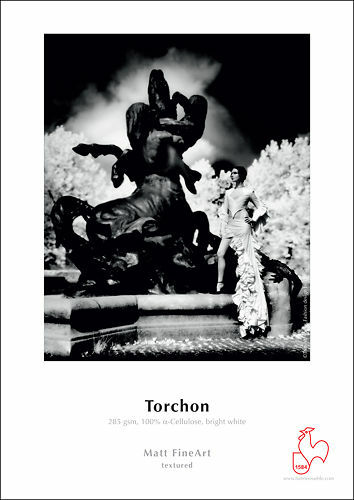 Our favourite warmtone fine art paper - with rich & velvety tones. It's also highly eco-friendly making it pretty much perfect in our book! 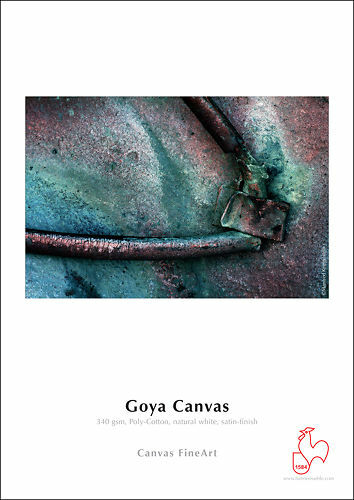 Classic European style art paper with satisfying weight and structured, moderate texture. One of the most popular textured papers! A heavier textured paper with a lovely organic look and crisp bright white appearance. 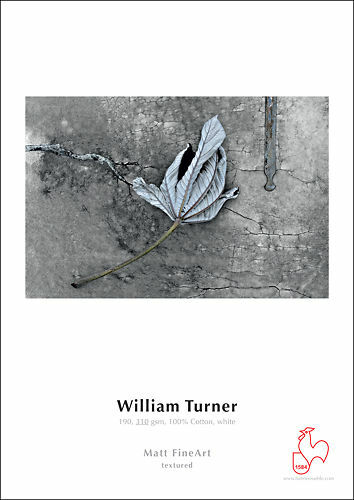 A popular lighter weight textured paper option ideal for reproduction of watercolours and softer photographic works. 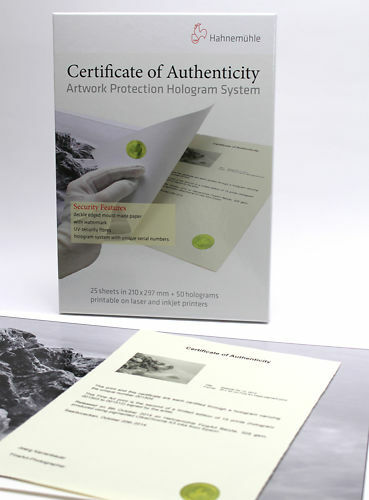 Authenticity Certificates for protecting your limited edition art works and reducing the risk of forgery. 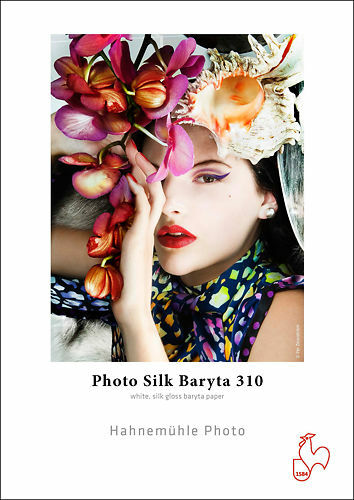 A high gloss,fibre based baryta paper with an ultra smooth surface texture. 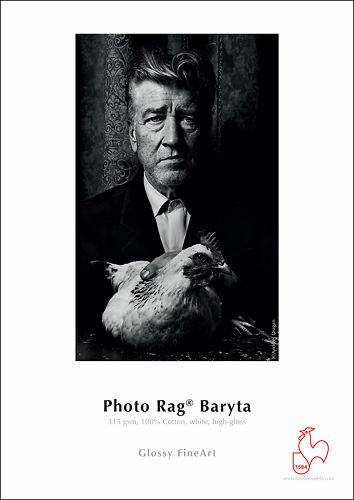 A slightly more textured darkroom alternative paper with rich, deep blacks. 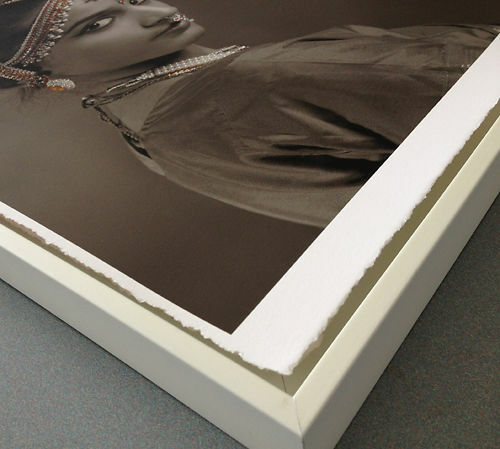 A semi-gloss, high grade paper that resembles a traditional fibre based paper. 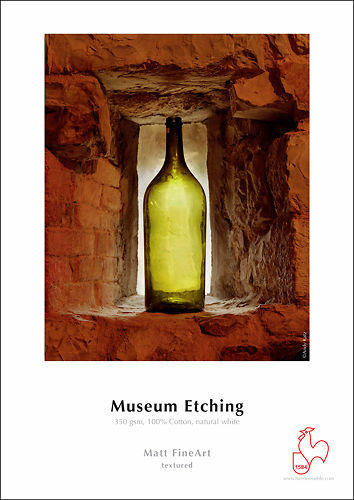 Archival quality traditional etching paper with no optical brighteners. 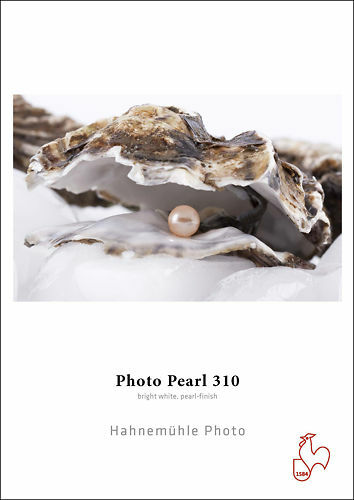 A classic photo paper with a high white point and broad gamut for vivid colour images. 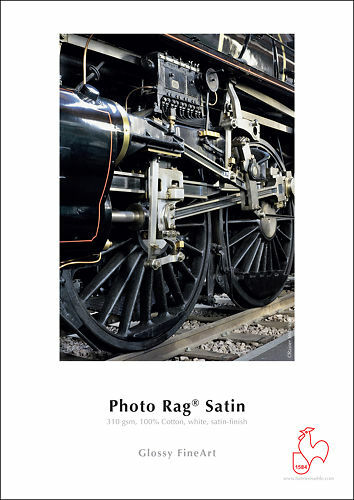 A very heavyweight version of the popular Photo Rag paper. 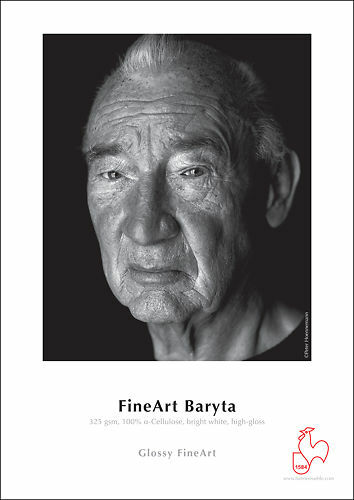 A baryta gloss paper with a very fine surface texture and no optical brighteners. 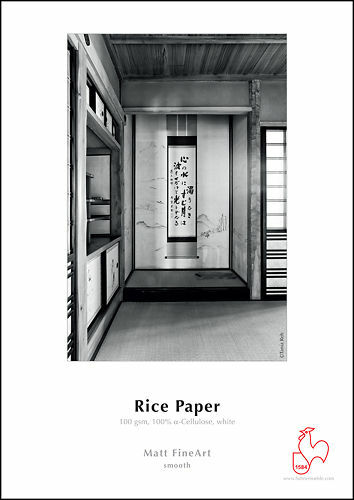 A paper made specifically for creating books or albums - has a determined grain for a smooth turning of pages. 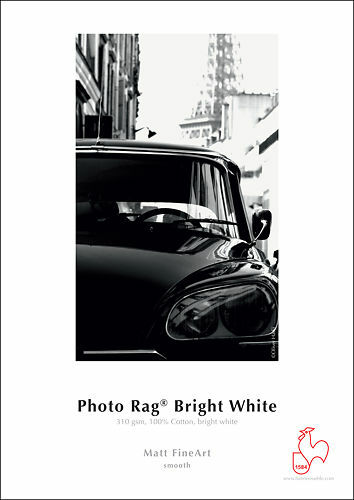 A pure white version of the popular Photo Rag paper. 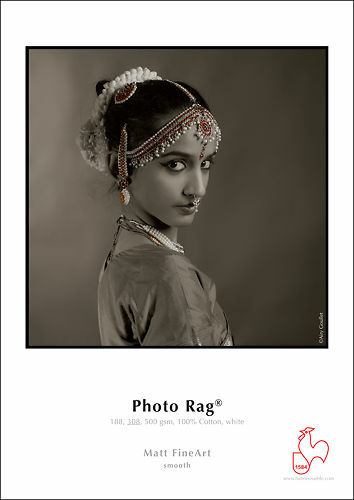 A beautiful hand crafted deckle edge version of the ever popular Photo Rag. 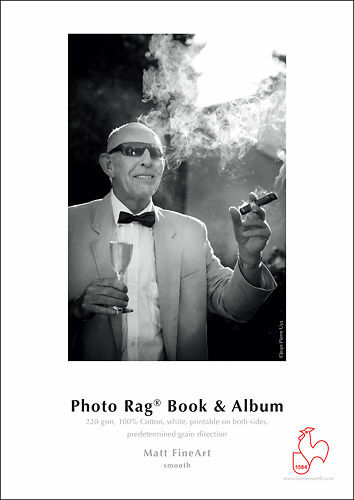 Photo Rag paper coated on both sides - perfect for doing folio books! 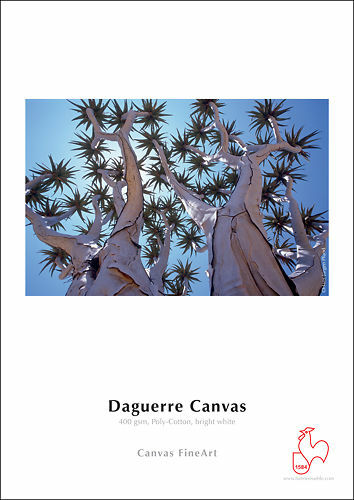 A 100% cotton, fibre based, semi-gloss inkjet paper that offers amazing deep blacks and a wide colour gamut. Unique paper with a satin appearance only on the printed areas! Accepts matte black inks. 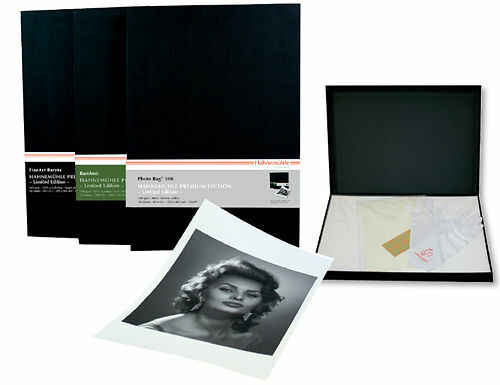 Premium Edition Pro pack with 50 A3+ sheets of archival paper, protective gloves and authenticity certificates in a beautiful archival box. 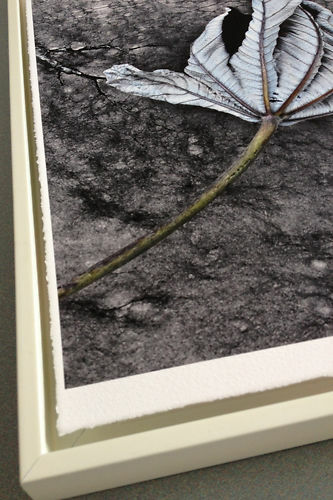 A natural white, 100% cotton rag paper with a matte watercolour texture.